This topic describes how to create remote asset videos using the Media module. Typically, videos are uploaded to Video Cloud using the Upload module. These files are then maintained by Brightcove. 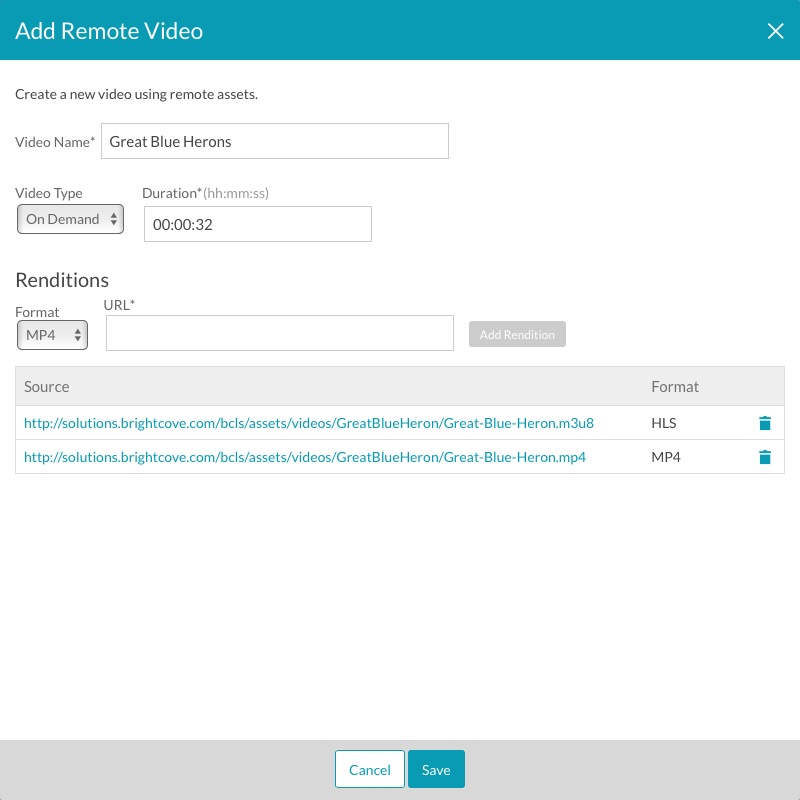 With remote assets, you maintain your video files on your own or a third-party system and then provide Video Cloud with the URL of the video file. 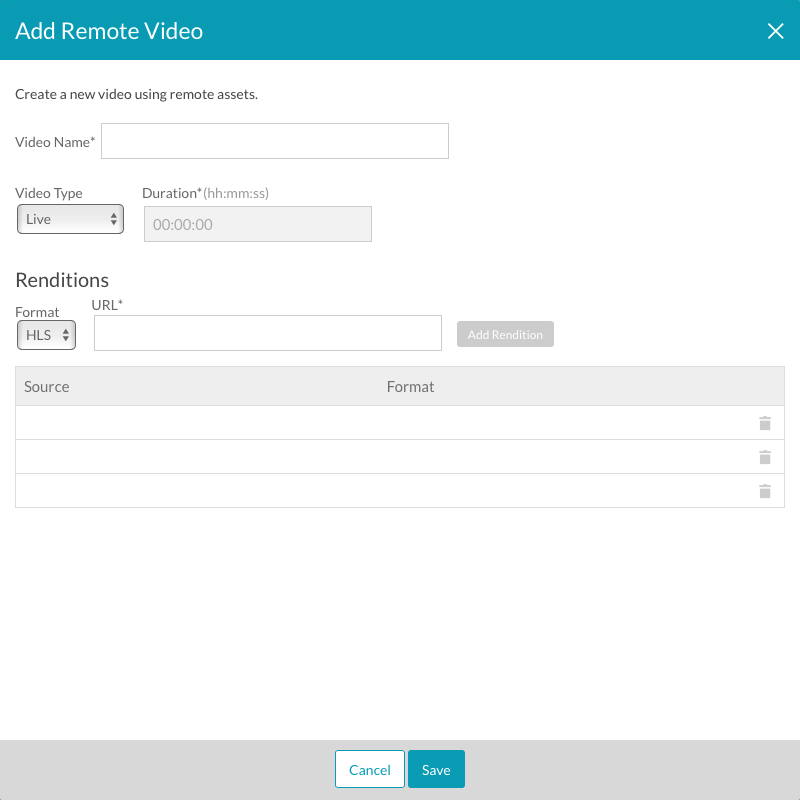 Note: The ability to create remote asset videos is available to Video Cloud Pro and Enterprise publishers. If you are interested in upgrading your Video Cloud account, please contact Brightcove for more information. Remote asset videos can also be created using the Video Cloud CMS API. For information, see the developer documentation. Remote asset videos created using the CMS API can then be managed using the Media module. All of your remote asset files must be available at a public URL without any requirements for authentication or access control. If your remote assets are hosted by a CDN, the URL of the remote assets should be the URL of the assets in the CDN and not the URL on the origin server. To create a remote asset video, follow these steps. Click Add Remote Video in the side navigation panel. The Add Remote Video dialog will open. Enter a Video Name. The video name will be displayed in the Media module and also in the player. Select the Video Type, Live or On Demand. For On Demand video types, enter the Duration in hh:mm:ss format. For each rendition, enter the Rendition URL and Format. Click Add Rendition. Note: Protocol relative URLs are supported. Click Save to save the remote asset. The remote asset video will be listed in the Media module. Remote asset videos will not have poster or thumbnail images, however, images can be uploaded. For information on uploading poster and thumbnail images, see Uploading Poster and Thumbnail Images. To edit a remote asset video, follow these steps. Click the remote asset video title to open the video properties. 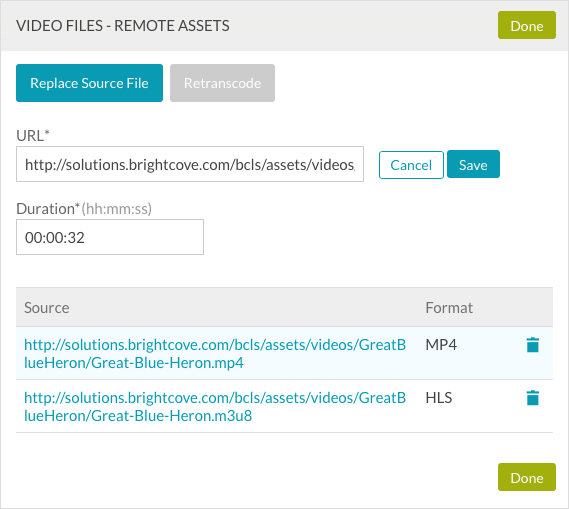 Locate the VIDEO FILES - REMOTE ASSETS section. Click on a Source row to select it. Clicking on the source URL will open it in another browser tab. Update the Source properties. Click Save to save the changes. You cannot use the image capture feature to create video still and thumbnail images for remote asset videos, however, video still and thumbnail images can be uploaded for remote asset videos.